The Higher Education sector needs to be developed with proper planning and prudent decisions. The government aims to develop the sector by addressing four major issues, State Higher Education Minister Mohan Lal Grero said. 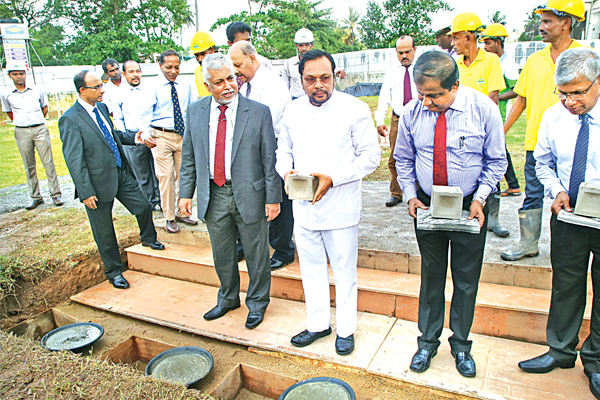 He was speaking at a ceremony to lay the foundation stone for the proposed eight storeyed academic building for the Post Graduate Institute of Medicine at Rajagiriya recently. The identified areas are students’ intake and admission, quality assurance and accreditation, employability of graduates and research and development, he said. Minister Grero said: "We started new courses and faculties to increase the intake of students such as technology faculties, and initiated to increase the number of students. Within five year period, our aim is to admit 35,000 students for the government university system which is a 10,000 increase of the current intake." The university system needs a transparent and independent body to assurance the quality and accredit the academic courses conducted by 17 universities, he said. "We decided to look in to two areas; institutional development and course development. The World Bank funded to conduct research to identify the areas to be developed and addressed. We published two guide books which provide instructions to the university authorities and UGC to implement the plans. We drafted the bill to establish an independent body to evaluate and accredit the higher education institutes in Sri Lanka," he said. "There is a problem with graduates from Arts, Humanities and social sciences fields with employability. If graduates cannot find a job in the job market, they have some limitations and boundaries which are not at the expected limit of the employers. It is our duty to address this issue with a vision. We have identified the need of the collectivity of the fields of technology, Arts, social sciences and humanities to design their courses. The courses should also contain soft skills, computer skills, leadership skills and other requisites skills by the job market. Five Universities have initiated to a special cell to communicate with the industries and companies around the university and which is identified as a successful answer for this issue.